Kotobukiya's line of DC Comics"New 52"ARTFX+ Statues continues, capturing the new looks and costumes of heroes inside the Justice League. 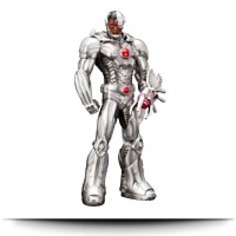 Cyborg completes the Justice League lineup, so be sure to collect them all. Cyborg stands practically 8 ½ Inch tall inside the ARTFX+ 1/10th scale and was sculpted by Atelier Bamboo (Goutaro Takeuchi ). The sculpting detail on Cyborg is phenomenal, with intricate cybernetic mechanisms such as the complex interlocking sections on his torso, heavy boots and also the powerful weapon on his right arm. 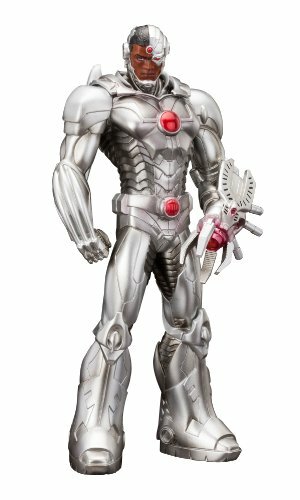 Accepting his newfound powers and the responsibilities they entail, Cyborg completes the elite lineup from the ARTFX+ Justice League. The technological hero is armored from head to toe with smooth panels interspersed with layered plates and segments. Like his allies, magnets in his feet give him excellent stability on the included Justice League logo display base. Under all of that metal continues to be the heart and soul of a young man and the only flesh and blood part of Victor that's visible is three-quarters of his face in addition to a sliver of his scalp. Joining the previously announced Superman, Green Lantern, Flash, Aquaman, Batman and Wonder Woman is the final member from the team, CYBORG.